This weeks show we discuss brand journalism – what is it & how can it help you? The Knowing Your Business radio show talk with Kevin Cull, Claire Taylor, Dominic Marchant, and Giles Lury to find out. Show time is every Thursday at 10am until 12 noon on Radio Horton. Allow me to introduce this weeks Knowing Your Business show guests, with their podcasts, websites and social media links. Kevin Cull talks about the SEO benefits brand story telling can bring. Every business has news and stories to tell. That news can help promote your company and increase your online visibility. As well as boosting your search engine optimisation, online stories help create awareness about your company. Google also now has a new search algorithm, It’s called “Hummingbird” It’s a digital marriage made in heaven. Claire Taylor writer, business consultant and co-founder of The Story Mill talks about the art of storytelling. The Story Mill has been created to stimulate authentic dialogue within businesses and also between organisations and their customers and partners. So that means telling authentic stories about the company and about the brand. Claire believes that storytelling is the fastest growing way of communicating in business today. People’s disillusionment with companies that they feel have pulled the wool over their eyes, coupled with the growth of digital communications have changed the game. Dominic Marchant the Managing Director of DJM Digital gives us his insights into how brand journalism works in the digital age. Dominic sits on the Interactive Media Council and divides his time between running the UK office and the recently opened NYC office of DJM. Giles Lury Executive Chairman at The Value Engineers brings you his take on brand journalism and so much more. This weeks Knowing your business show is presented by Ian Gentles and guest presenter Joy McCarthy. Ian Gentles the Digital Marketing Manager of Banburyshire Info and Knowing Your Business. Joy McCarthy the Oxfordshire copywriter. Ardent thought-bubbler who thrives on chaos. 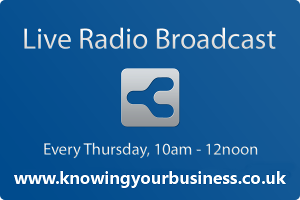 Knowing Your Business Show time is every Thursday at 10am until 12pm on Radio Horton.